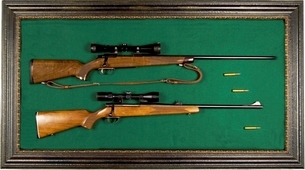 A Rifle Display Case from our Select Edition that is a masterpiece unto itself. Crafted with classic appointments that make this display cabinet as valuable as the guns it displays. The premier wooden frame opens and closes for access to your guns and is latched to secure your prized guns. The frame is attached to the furniture grade side panel that lies tight against the wall, giving it that clean built-in finish you expect from a quality wall display case. Your guns are mounted against a rich green fabric background easily, safely, and inconspicuously using our mounting hardware that�s included � its elegance is in its simplicity. Damaging your memories is not an option. In addition, the wall-hanging system on the back side ensures that the display case attaches securely to the wall protecting your valuable rifles and firearms. Everything you need to do a professional job in securing your gun display case to the wall is included. The only thing missing are your guns to showcase in this classic shadow box display case. Fabric -	Green colored fabric over dense foam underlayment.